Link, Mario, Daisy, Luigi and Toad play at ConBravo! It might seem like a bold claim, but videogame music is some of the most influential music of the past 30 years. For millions of kids, myself included, the music I heard most often at home wasn’t coming from a radio or a record player, it was coming from the videogame console. How many times did I hear that ten-second loop from Star Road in Super Mario World? How many times did I play the Song of Storms in Ocarina of Time for no other reason than to hear the Song of Storms? The menu-screen music from The Secret of Mana is lodged deeper in my brain than the answers to any test I ever studied for, that’s for sure. We can all collectively be thankful then that the music accompanying our on-screen adventures wasn’t just filler: it could be catchy and funky, whimsical and weird, lyrical and heart-wrenching. 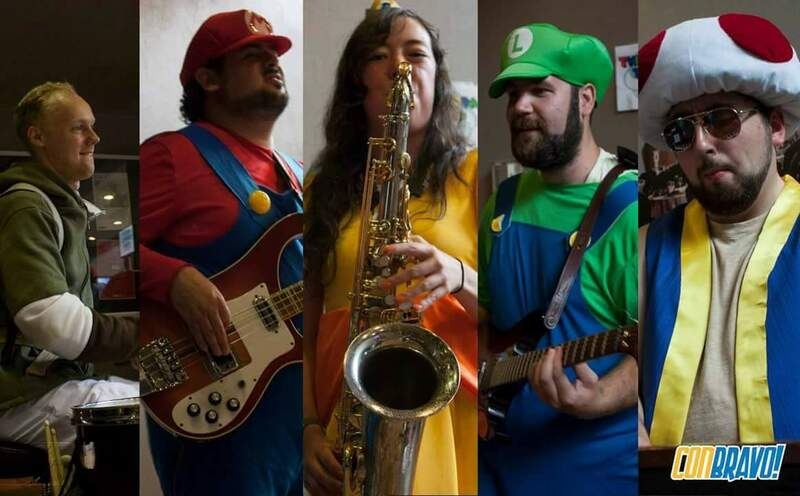 Videogame music got into the ears of people all over the world, and in particular into the ears of five of Hamilton and Toronto’s finest young jazz musicians: The Koopa Troop. You might recognize a few familiar faces (even if they’re in costume) in the band from Steel City Jazz Festivals past: Tom Altobelli on bass, Chris Bruder on keyboard, Chelsea McBride on saxophone and flute, Wilson McLeish on guitar and Tyler Goertzen on drums. The Koopa Troop bring serious jazz chops to the world of videogame music, playing their own arrangements of classic videogame tunes. The music is accessible, high-energy and funky, but there’s enough jazz flair thrown in to satisfy even the more traditionalist jazz concert attendees. For anyone out there who is curious about jazz music but has found it hard to get started listening, the Koopa Troop are the band for you. And in this spirit of discovery and accessibility, we decided to open the show up to the widest possible audience by making it absolutely free! In our first year we were able to offer a free concert at the Hamilton Waterfront and it was one of my favourite performances of the festival. I have wanted to incorporate free events into the Steel City Jazz Festival ever since. But to be honest, it’s not easy! The Steel City Jazz Festival also feels strongly that artists should be paid a fair wage for their work, and that can be very hard to do without any ticket revenues. So our sponsors Smordin Law, the Ontario Arts Council, NLP Canada Training and Merriam Music deserve an extra special thanks for helping us to achieve both of these goals at the year’s festival! They are our Tanooki Suit, our triple red shells, our Master Sword. The Koopa Troop play for FREE Ocotber 24th at 2pm at the Pearl Company, don’t miss it! Email info@thepearlcompany.ca or call 905-524-0606 to reserve a spot. Steel City Jazz Festival The Koopa Troop: FREE Matinee Performance October 24 at the Pearl Company!